My Ave Maria Radio colleague, Al Kresta, is host of the daily talk show, “Kresta In the Afternoon,” heard on about 400 radio stations. The line is classic Kresta, reflecting both his quick wit and his honest self-awareness. Charles Aznavour faced Al’s problem, but with a twist. Based in France, he was a true international superstar, a singer-songwriter known around the world, but recognized and followed by only a narrow audience within the United States (the world’s single largest music market). That must have been a frustration for someone who had written more than 1,300 songs, some of which became standards in the U.S.
Don’t get me wrong, Charles Aznavour had his American fans — my wife, Kathy, and myself among them. Those fans appreciated him, not primarily as a vocalist, but as someone who had a uniquely captivating performance style. He described himself as “an actor who sings,” and that was right on target. His voice wasn’t listenable in the ordinary sense, not musically pleasant. And his songs didn’t conform to the conventionalized, “hooky” structures of pop music. Rather, his jerky, gravely baritone was a perfect vehicle for conveying the dramatic or comic slices of life captured in what were actually little musical vignettes of human experience. One of his finest pieces, “Happy Anniversary,” tells of a husband and wife getting dressed to attend a show, only to encounter various comic mishaps that turn their big evening into a farce. In the end it’s clear that their shared humor was the real celebration of all the years together. Back in the 1970s, Kathy and I found the song poignant. Today, we’d think Aznavour was writing about us. That idiosyncratic and deeply personal approach kept Charles Aznavour from breaking through to mass U.S. appeal. With rock-’n-roll coloring just about every musical genre, too many people had became enamored of gimmicks and bombast. Aznavour was too intimate, too subtle, too French to make him a top draw here. But no one who gave him a chance could ever deny that they had seen a genuine artist at work. I saw Aznavour perform at Princeton University’s McCarter Theater, a modest-size venue, with no seat too far away, that was perfect for his show. He stood at a microphone on a darkened stage, backed by a small accompanying ensemble, his white linen tropical suit caught in a single spotlight. This was the entirety of his physical presentation, keeping focus on the interpretive singing, the expressive face, and the animated hand gestures that were his stock-in-trade. Through the power of these simple elements he owned the house that night. Charles Aznavour died Monday at the age of 94, after a long career that had begun at age nine. He will be remembered by those of us who were touched by his art — and who appreciate how hard it must have been for him to be famous when nobody knew who he was. He wasn’t unknown, just French. Thank you Bill for reminding us that songwriting truly is an art. It is so very difficult these days to hear a well-crafted song. Where have the Ira Gershwins and the Johnny Mercers, the Jerome Kerns and Irving Berlins gone? And why don’t people seem to appreciate them anymore? The songs that those people wrote will always catch our hearts, make us smile, shed a tear. I think that with the advent of Rap and Hip Hop, lyricism went into the dumpster and vulgarity without innuendo now reigns supreme. And it shouts to be heard. How sad is that? It is poisoning our music culture and is crushing the life out of love. Must the well-crafted song be relegated only to the memories of the elderly? Thank God for artists like Aznavour. Now I think I want to put on some old Hoagy Carmichael and dance with my wife. What a surprise to read your blog! I absolutely adored him! I cried when he died! What an incredible man he was! Thanks for doing this as a tribute to an incredible talent! I am also from Phila. and was friendly with Sid Mark who had a program forever of Frank Sinatra! I’ve tried reaching him! I would be very grateful if fans of this blog — loyal as I know you all are — would do everything you can to recruit new readers. That means suggesting to friends, relatives and colleagues that they check out my scribblings. And, please be sure to pass along my Facebook posts. Also, if you would be so kind, please click on the LIKE button below. Read a Good Book Lately? The Best an Ad Can Get? From the opening words of Bill Kassel’s novel we are drawn into the complex and colorful world of first century Israel. The reader is caught up in the drama of Christ through the eyes of Jesus’ natural family. Kassel’s work is unconventional, exciting and controversial, offering fresh insights and inspiration for believers and non believers alike. My Brother’s Keeper was, for me, a most gratifying reading experience. The book is beautifully written. And even with my limited early Christian history knowledge, I could tell that it had been exhaustively researched. I consider it a significant literary achievement. It was a privilege to read it. It makes the Gospels come alive in a new way. I loved it. This was a fascinating book! It was not what I thought it was going to be. I thought the main character, James the Just, was going to turn out to be one of Jesus’ Apostles and the book would describe what it was like to spread the Good News. Instead, it came from the perspective of a family member who was not 100% sure that Jesus was the Messiah. Not only that: James the Just had a sort of friendship with Pontius Pilate. The entire book put you in the Holy Land while Jesus walked. It was a fascinating read. I would recommend it, and already have! If I lived in the time of Jesus, who would I think He was? What would I have believed about Him? Would I have espoused His teachings? It wasn’t like being raised Catholic in the 20th century. 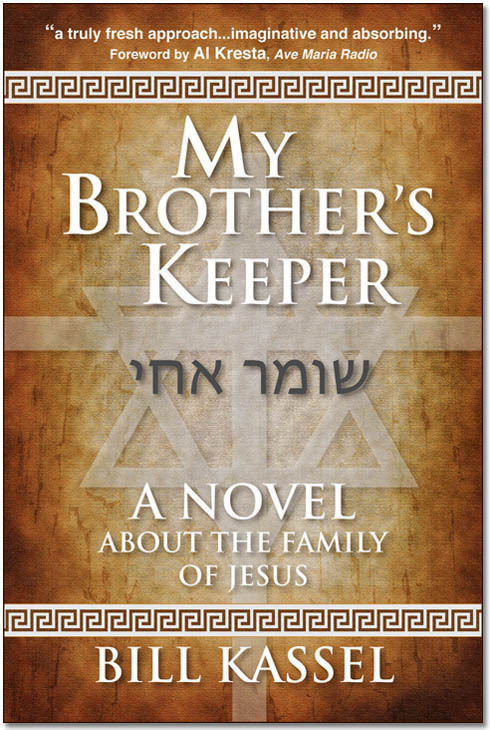 My Brother’s Keeper made me realize in a fresh new way how hard it was, in Jesus’ time, for many people — especially Jews — to believe in Jesus and how amazing His mission really was. This book is one of my favorites. My Brother’s Keeper, from page one, invites you to go deeper into the daily life and time of Christ. Most of us are very familiar with the scriptures that give us an account of his life. This book takes you to a personal level that creates a very real image of not only the people but how Christ’s relationships and decisions created a life outside of themselves. How Jesus related to his family, and how his family saw him, bring a very realistic aspect to his life, and created the beginnings of a more personal understanding of Christ in my own life. Well worth reading. Kassel Takes Biblical facts, Historic facts, Jewish facts and traditions, and weaves them into a compelling narrative. The dialogue is believable and enlightening. You really feel like you are there it is so well written and believable. I honestly couldn’t put it down even though I know the end as the Bible tells it. Kassel captures the emotions of the characters and they are believable. A very compelling and enjoyable read. Bill Kassel has created a vivid landscape for his characters that can be clearly seen felt and almost touched. The Interaction between the characters is understated and dutiful with silent respect. The reader can almost hear their thoughts in humble reverential tones. The relationships between the characters comes across as genuine and the narrative moves along smoothly. And the storyline in engaging. All in all a very good read. The subject matter and historical period are interesting to me so I find this a good read. I am Catholic but I think the book would be of interest to any Christian who would like to read a fictionalized rendering of what life might have been like for Jesus’ brother, James. Read this book. ’Tis a very interesting speculation about the family of Joseph, James and Jesus as the Jewish foundation to the Catholic faith. Bill Kassel explores the impact Jesus’s birth and ministry had on his family, specifically Joseph and Joseph’s son James. Diligent research vividly describes the geography of the region and portrays the culture and politics of Judaism at that time. Not the typical retelling of the story of Jesus. Kassel poses questions that challenge the reader to rethink basic premises and meditate on new perspectives and their impact on the reader. Fantastic! Transported me back to Jesus’ time. And a new perspective on James. Great read. Reading “My Brother’s Keeper” is like being part of the part of the crowd at the crucifixion. Mr. Kassel transports you into the Word. I was there and understood the life of Jesus and his family situation. I am a Protestant, and there are a few things I can’t agree with, but I thoroughly enjoyed the book and Mr. Kassel’s grasp of the English language. I was there with my Savior. Kassel relates the life and ministry of the Savior of the world through an inspired, historical, and personable lens… His faith, research, and talent shine through the portrayals of the characters James the Just, Simon Peter, Joseph of Arimathea, Mary the Mother of our Lord, Pontius Pilate, and various others. I commend his authorship and recommend “My Brother’s Keeper” to any seeking to kindle a love for those who shared in the Master’s mortal life and ancient Israel. Kassel adheres to the biblical accounts of Christ’s life, expounding with full creative license potential causes, emotions, and situations that might have occurred among the ancient Jews. I pray that you enjoy the story of James the Just, and join him in discovering a greater love for the Son of God, and our fellow men.